In Thailand, fish sauce is called nam pla. It is made of anchovies and salt which are fermented for 6 to 12 months under the tropical sun. The process of fermentation leaves behind an elixir laden with flavor and concentrated glutamic acid. This elixir creates a mouthful of flavor when added to salads, soups, curries, stir-fries, dipping sauces, rice and noodle dishes, or served simply as an everyday condiment – Nam Pla Prik. It is is a medium-brown liquid that is available in bottles of various sizes ready to use for seasoning and cooking. When it comes to Thai cuisine and culture, one can’t live without fish sauce. It is important to get the best quality fish sauce, so I have some recommendations for buying it outside of Thailand. My favorite fish sauce brands, which I use interchangeably, are Thai Kitchen, Tiparos and Three Crabs. Once the bottle has been opened, you can leave it out at room temperature if you cook with fish sauce often, otherwise you can keep it in the fridge for up to 6 months. When it gets too salty or stale, replace it with a new bottle. Thai people from all walks of life always have fish sauce in their kitchens and typically use it every day, either in their cooking or as a condiment. Thais value its significant flavor and Nam pla is part of Thai people’s lives, regardless of whether they are from rural villages, big towns or the capital city of Bangkok. In fact, it is a Thai’s best friend in all life situations, but especially in economic down times, or for newly married couples starting their lives together. When Thais face financial struggles, one often says “a fish sauce and warm rice is simply enough” (in Thai: มีข้าวกับน้ำปลาเพียงพอแล้ว). When we go through a tough time and have just enough money to buy rice and fish sauce, life is still good, still filled with hopes and dreams, and we still have each other, for richer or for poorer. 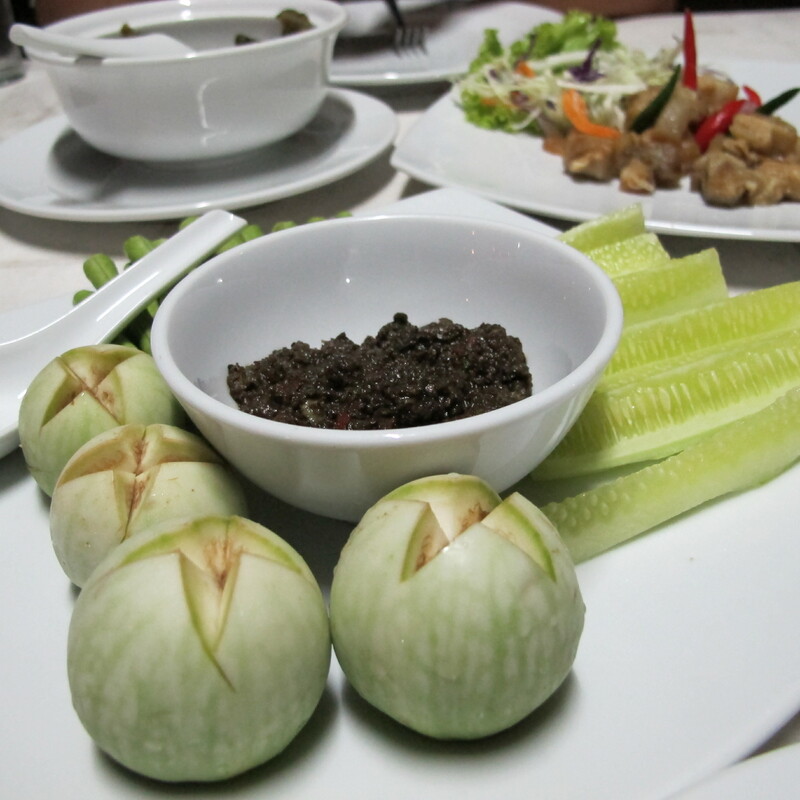 Nam pla prik is no secret to Thai dining; Thais use it the way Americans use salt and pepper. This liquid of chili and garlic-infused fish sauce is delicious over warm steamed jasmine rice or just about any Thai food you are about to savor. The fresh layer of fish sauce enhances the food and adds another dimension to each mouthful, heightening the experience on your palate. My favorite way to use it is over a fried egg and steamed hot jasmine rice, with fresh sliced cucumber and tomatoes alongside. Any time you are dining at a Thai restaurant, you may ask for nam pla prik the same way that you would ask for salt and pepper. 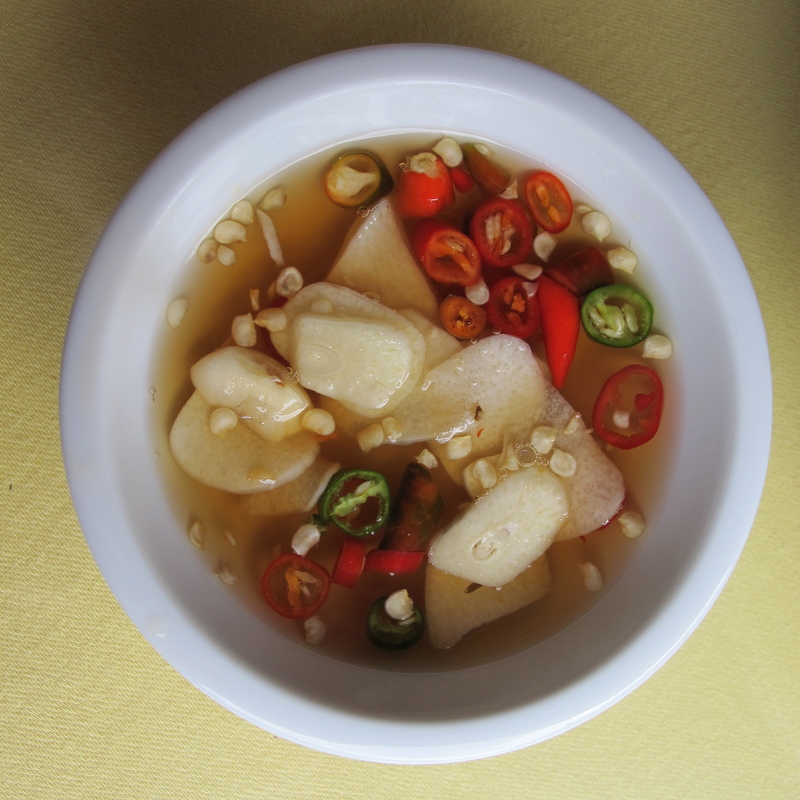 Stir fish sauce, Thai chiles, garlic, sugar and lime juice together in a small bowl. Use this spicy fish sauce for seasoning. You may keep it in an airtight jar up to 2 weeks in the refrigerator. I have been gone from regularly writing in my blog and would like to thank you for your patience. I haven’t forgotten it. In fact, there are many posts with photos and recipes waiting in line! Finding time to focus on writing has been most challenging as I am thinking in two languages but must write it in only one. Here is the Sweet Chili Vinaigrette Recipe that I promised to recreate after the Thai Dinner at Dog Mountain Farm last fall. Finally last month I had a scrap of paper in my hand with my notes on the ingredients and quantities and all of the necessary ingredients in my kitchen. With a little fine tuning, Sweet Chili Vinaigrette is now ready to share with you to help you welcome summer. This delicious dressing has been enjoyed by my friends and family. It is good for easy entertaining as well as for an every day salad dressing. It is a Western dish with an Eastern twist! Just two weeks ago I was lucky to have Sylvie, a French chef, caterer and the owner of Sylvie Cooks for lunch. While I prepared Asparagus & Lovage Soup, Sylvie helped me prepare the salad and sweet chili vinaigrette. Thirty minutes later we were enjoying the soup and salad in the warm sunlight on the deck. Thank you to Sylvie for a great presentation on plating the salad. 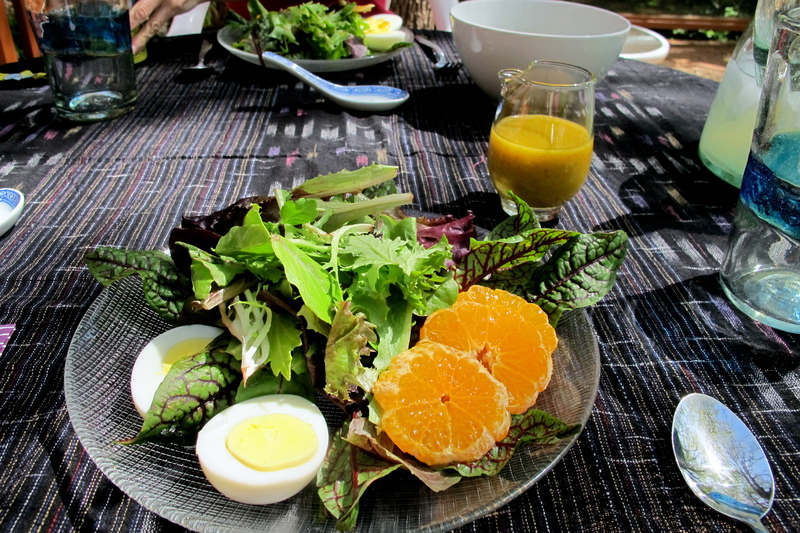 In the photo I use an organic mixed green salad with a few fresh red sorrel leaves from my garden, a hard-boiled egg and a mandarin orange. Having friends over for lunch should be fun and casual. In my case it is often spontaneous in time and cooking style as well. My Thai take on a vinaigrette when cooking for friends and family is not constrained to just one tradition. In fact, this is not a traditional Thai recipe but a study of the tastes of Thai ingredients co-existing with Western cuisine. It illustrates for students and blog followers that often we can take one ingredient beyond where we usually find it. In this recipe I use the Thai sweet chili sauce, fish sauce and lime juice that I would use in traditional Thai salad dressing (nahm yum) and combine them with the ingredients for a classic vinaigrette such as olive oil, vinegar and mustard. 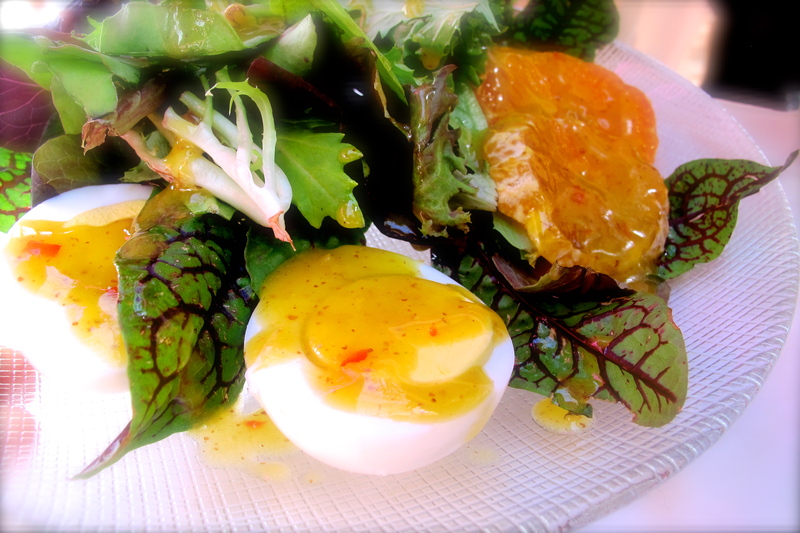 The forecast for Seattle promises a long week of sunshine and warm weather, so I will prepare hard-boiled eggs and sweet chili vinaigrette again tonight and keep them in the fridge. For dessert, I will prepare Yangon Almond Pancake to serve with strawberries and whipped cream. 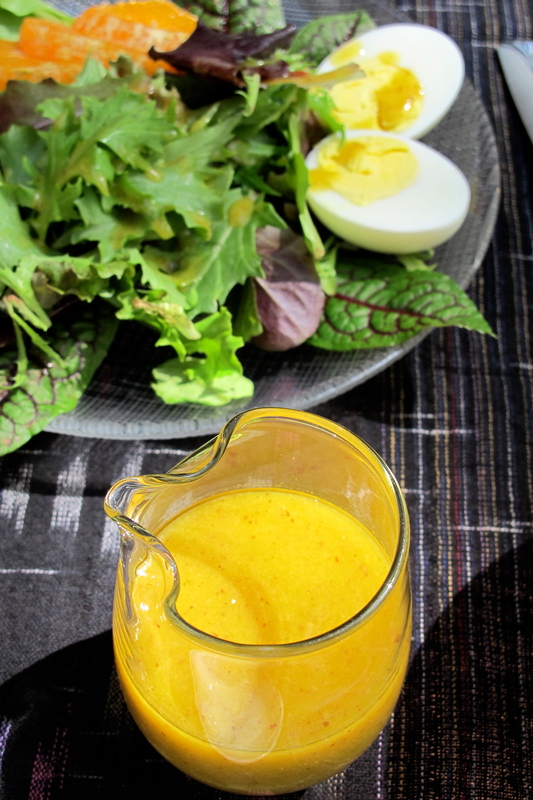 Sweet Chili Vinaigrette is easy to love and easy to adapt. The flavor is great—you will hardly recognize the fish sauce or sweet chili flavor, just a nice balance of sweet and salty. The fish sauce is used here in much the same way as a French vinaigrette uses anchovy. The sweet chili sauce has complex ingredients like garlic and chili, but is also just a plain sweet contribution. I love the tangy flavors of the vinaigrette. I recommend adding toasted sesame seeds to the dressing or to the salad itself to bring out more flavors of sesame oil and an essential oriental flavor and texture. Whisk sweet chili sauce, lime juice, coconut vinegar, fish sauce, sea salt, white pepper powder, mustard in a medium size bowl until well blended, about 30 seconds. While whisking rapidly with one hand, use the other hand to pour in the sesame oil and olive oil. Continue whisking for 1 more minute to emulsify the dressing. An alternative method is to place all of the ingredients in a salad dressing bottle and shake well, then shake well again before serving with your choice of salad. In 2011, on the day after Chinese New Year, my brother drove his pick-up truck with three passengers – my sister, sister-in-law and I — to Samui Island, or Koh Samui. 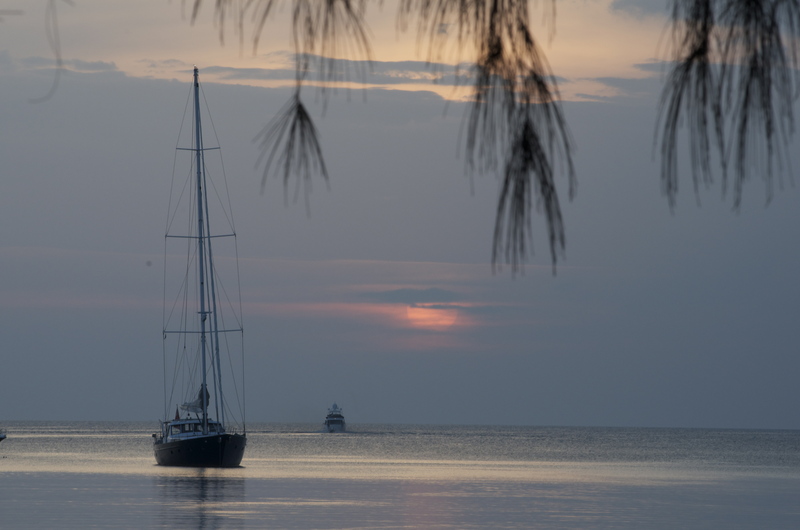 We left Phuket before the sunrise around 5am and arrived at Koh Samui at sunset. We went to Nathon, the island’s main town, and stayed at the Grand Sea View Resortel. A friendly staff person who was native to the island recommended that we dine at the hotel restaurant, which had a set menu of local Koh Samui cuisine. While we enjoyed the sun setting right in front of us, we feasted on six dishes that highlighted Koh Samuicuisine: Pork & Mackerel with Pickled Mustard Green Soup, Green Peppercorn Chili Dip, Stir Fried Sweet Pork with Soy Sauce, Grilled Tuna in Red Curry with Cumin Leaves, and Stir Fried Glass Noodle with Green Papaya and Minced Pork. Though we are southerners from the other side of the peninsula, we discovered that our southern cuisines are prepared in much the same ways, though with a different combination of ingredients. Green peppercorns are widely used in Thai, French and Western European cuisines. 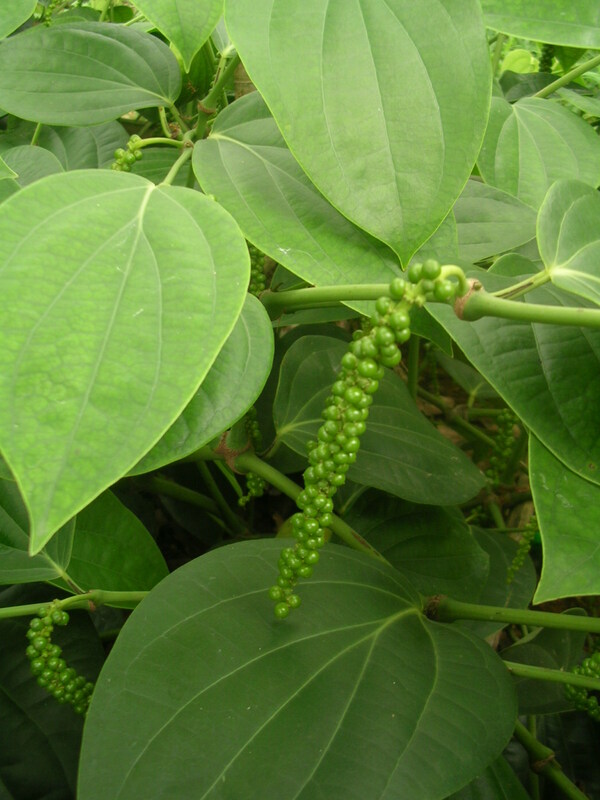 In Thailand, you can find fresh green peppercorn everyday in wet markets and as a staple ingredient in Thai restaurants. They are very aromatic, fresh tasting, and have a mild flavor of black pepper. Though you can use green peppercorns in the place of black peppercorns in Western cooking, that is not a practice in Thai cuisine, where green peppercorns have their own place and they define such dishes such as Phad Cha, Klue Gling, Phad Ped, Green Curry, and any stir-fry that has curry paste or pungent herbs as a component. 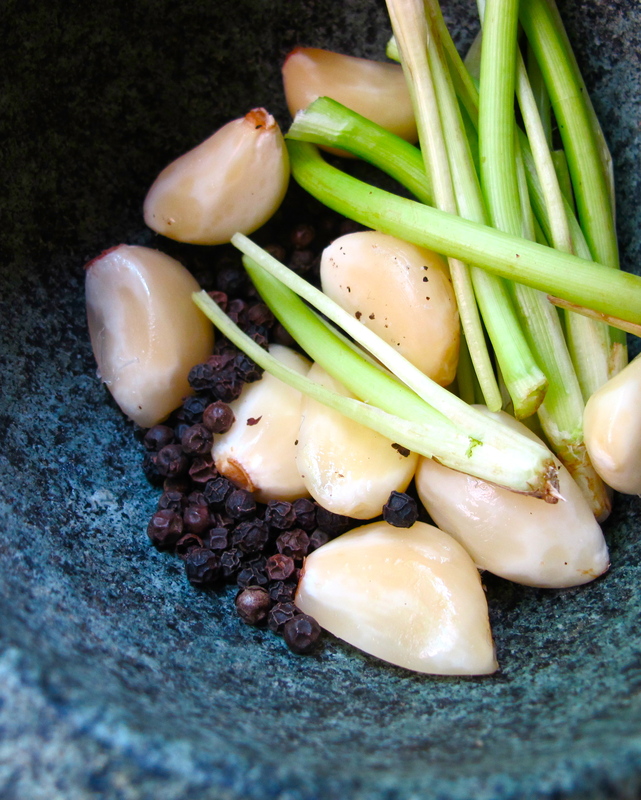 Green peppercorns create a playful flavor in all of these dishes, which generally have a rustic Thai style of cooking. 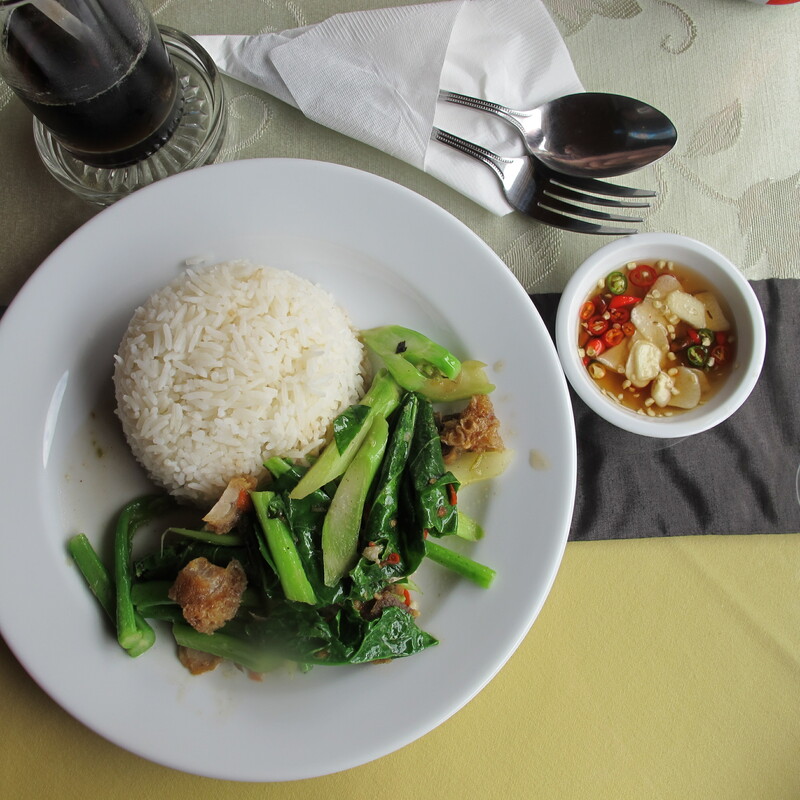 In-depth Thai cuisine is a healthy cuisine. Our ancestors cleverly disguised spices and herbs in our foods to accentuate and distinguish the flavors, but as we eat and enjoy the tastes, we are also taking in a healthy benefit for our bodies. As for green peppercorns, the instant benefit is to promote appetite and aid digestion, and to serve as a diuretic to promote body sweat. The executive chef at Grand Sea View Resotel gave us a lesson on Samui local cuisine the following day. If you visit Koh Samui, please call ahead to arrange a time. The restaurant doesn’t have a regular schedule, but is available on request. 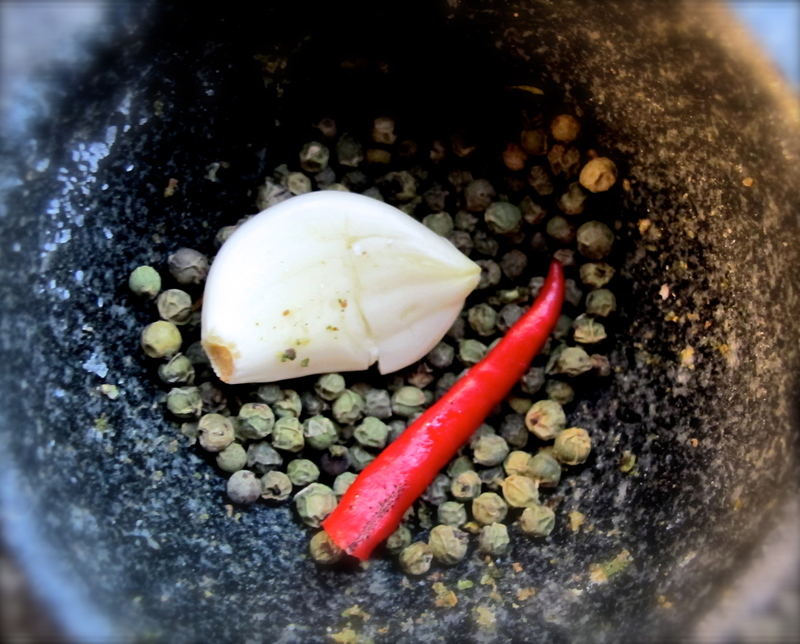 I improvised with what we have here in Seattle: dry green peppercorns, garlic and Thai chili. Now the dip is ready for the dining table. 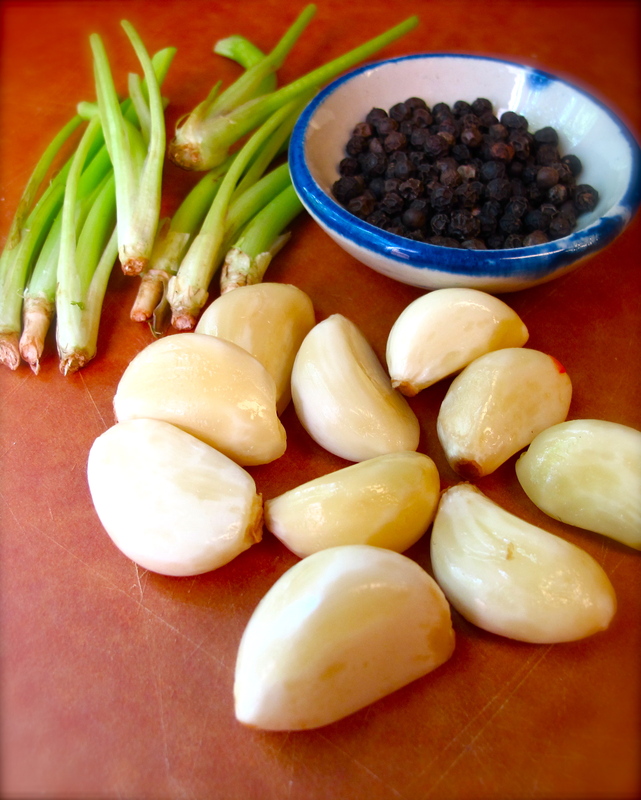 I use it as a condiment to add extra flavor to Thai and non-Thai dishes or to aid digestion. Since I remade this dish at home, I enjoy it often. Not always as a chili dip like in Thailand, but often as a condiment like salt and pepper. When I prepare a Thai meal, I use shrimp paste in place of the sea salt I would use in a western dish. Simply treat this green peppercorn chili dip as a new way you can use anytime to serve salt and pepper to your family and friends—especially during the holiday season when a seasoning can be a home remedy to aid the digestion of a large meal. No need for Pepto Bismol! 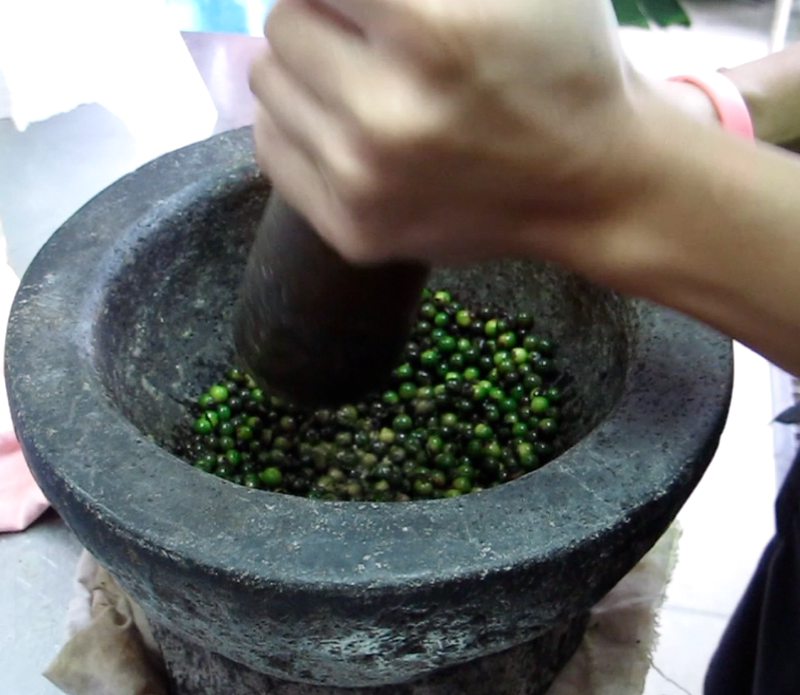 In a mortar with pestle, pound green peppercorns until they form a fine paste. Then add Thai chili, garlic and sea salt or shrimp paste and pound until the mixture blends into a paste. Place in a small bowl and set on the table with a small spoon to use it as a condiment to rice or a main dish. To consider oneself a Thai cook, one should understand the fundamentals of Kratiem Prik Thai—garlic-black pepper-cilantro root seasoning paste. Like Nam Prik or chili dip, it is a truly Thai invention without any influences from neighboring countries. Like the classic pesto sauce that originated in Genoa in the Liguria region of northern Italy, Kratiem Prik Thai is a classic Thai culinary seasoning that has been around for as long as the existence of Siam. The Kratiem Prik Thai paste is simply made with just the three main ingredients of garlic, black pepper and cilantro. When balanced with salty and sweet from soy sauce and brown sugar, they deepen the flavor of grilled meat, appetizers, meat patties for soup, or marinades for meat before deep-frying. Then sweet chili sauce and Sriracha hot sauce may be served alongside the meat with a vegetable condiment. 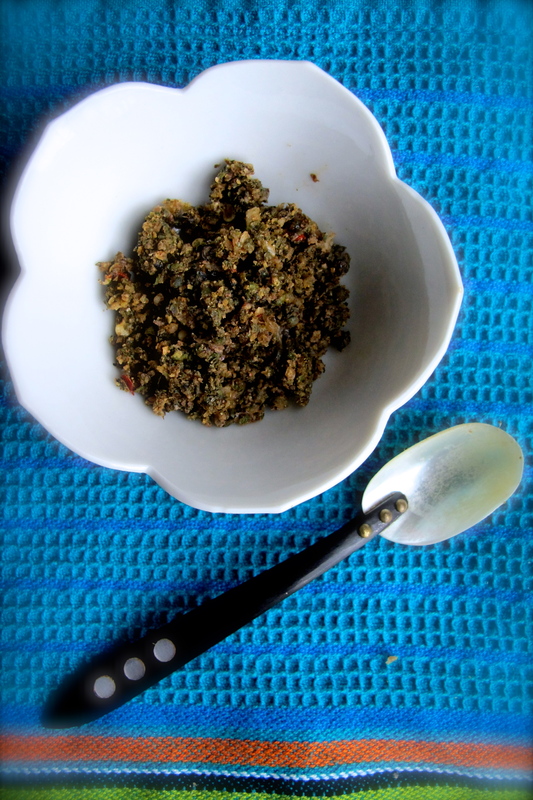 I hope you have a chance to learn how to make the Kratiem Prik Thai paste below and experiment with it in your cooking at home, from marinating your steak to adding it into a meat patty or simply sauteing it with seafood for a quick and easy main dish. 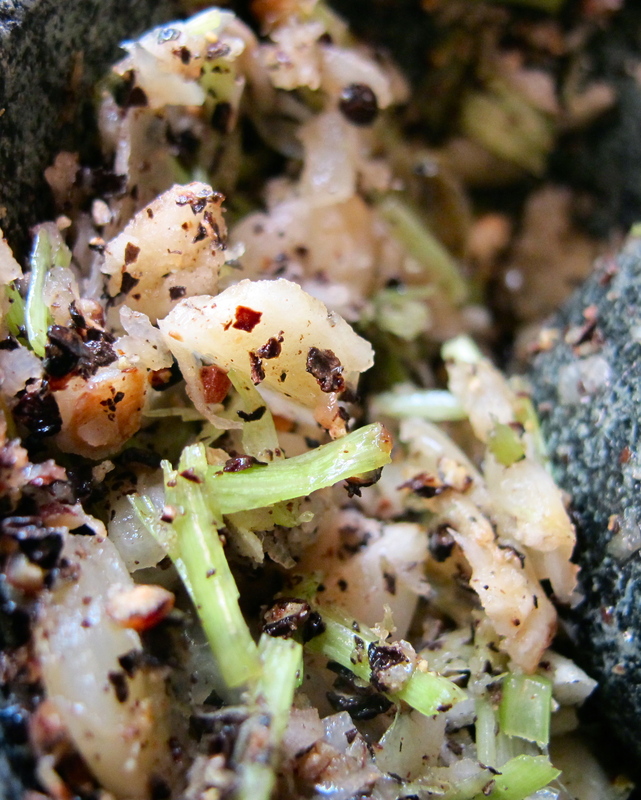 Place garlic, black pepper and cilantro roots in a mortar. until it forms a fine paste, about 2 to 3 minutes. Add brown sugar and soy sauce and stir in circular motion with pestle until it is well-blended and smooth. This recipe makes a large quantity. You can store it in the refrigerator and use it as needed, or freeze it in convenient quantities in an ice cube tray. Use 2 tablespoons of the finished paste per pound of meat or seafood as a marinade before grilling or frying. You can also use it as a basic seasoning paste in ground meats cooked for Thai appetizers. Please click on the photo for a link to a recipe for using the paste with seafood or shrimp. Place garlic, black pepper and cilantro roots in a medium size mortar. 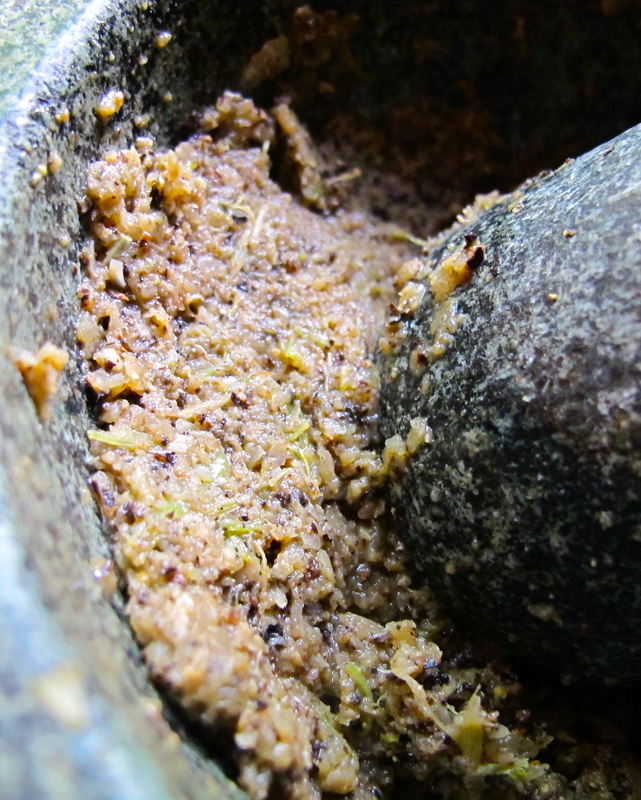 With pestle, pound the ingredients until they form a fine paste, about 2 to 3 minutes. Add brown sugar and soy sauce and stir in circular motion with the pestle until it well-blended and smooth. Store in a mason jar in the refrigerator for a week, or freeze for up to 6 months. Please see suggestion above on how to incorporate this seasoning paste in your cooking. Alternative preparation method: Place garlic, black pepper, cilantro roots, soy sauce and sugar in a blender and blend until it reaches the desired texture. I like the consistency shown above which still maintains a little texture. Note: Please wait to see my next post when I will discuss in depth how to incorporate Kratiem Prik Thai Rark Puk Chee seasoning in your daily cooking. I grew up in a world full of lemongrass and could tell you thousands of stories that evolve around this fragrant herb, from planting and cooking it, to all things related. But I will keep this short and sweet so that you can go straight to my recipes and prepare them. Here in Seattle, I always have many lemongrass stalks in my refrigerator—not in the backyard like in Thailand, but both methods work for the Thai cook who wants to be able to add lemongrass to a recipe at a moment’s notice. When I do a hands-on class I make sure students learn how to prepare lemongrass three ways (please watch the video). This lesson results in a lot of leftover lemongrass, which I cook, freeze, or make into a powder. A few days ago my friend was visiting me and our discussion of this and that led us to the kitchen. I wanted to make a pesto-like paste for her to add to her marinade sauce. I decided to stop short of making the lemongrass paste and we wandered off to another topic. The idea for us today is to use up the lemongrass in my fridge and turn it into a versatile form ready to be incorporated into many dishes such as a wet rub for a marinade or a lemongrass tartar sauce to go with fried rock fish for a family dinner. 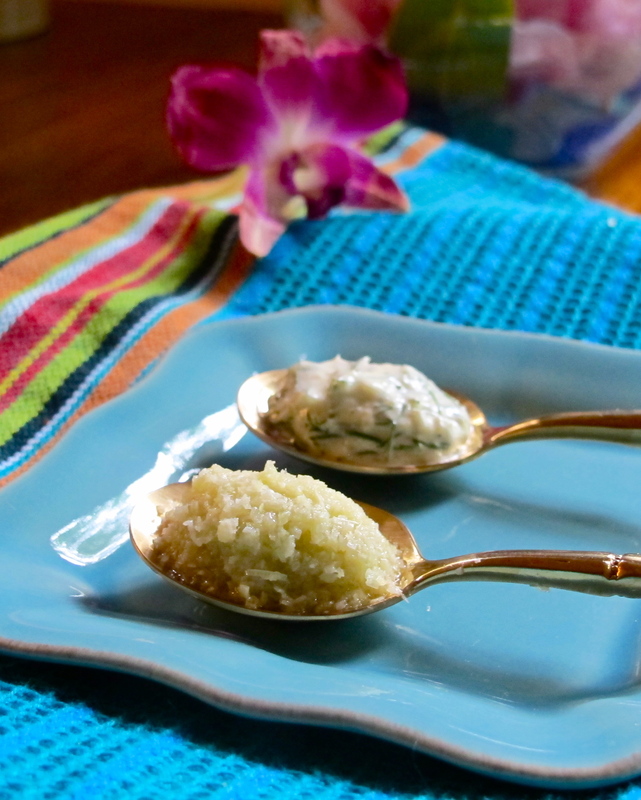 I wish you fun cooking this summer with the lemongrass paste recipe from my kitchen. First you have to start your lesson at home by learning how to prepare lemongrass for Thai cooking. Slicing lemongrass properly is an important part of Thai cooking. I hope you spend some time learning the right way to do this and get enough experience to develop a solid technique. Don’t try to save time by slicing lemongrass into bigger pieces because you are using a food processor. The grain of this fibrous plant runs lengthwise of the stalk, so slicing it thinly against the grain is essential. Besides, it provides aroma therapy and a mindful moment in the kitchen! Lemongrass has a citrus aroma that can blend into any dish. I make a lemongrass paste using extra light olive oil that you can use well beyond Thai cuisine. Like lime and lemon, it blends itself into any cuisine. I spread it out on toast like pesto, or add it to rice, curries, marinades, or just about anything. All become so delightfully fresh. Also, to my amazement, the fragrance of lemongrass and olive oil are divine together. Place lemongrass, olive oil and salt in the blender or mini food processor and blend. Use spatula to clean the side to make sure it well mixed. Repeat the process repeat the process several times until getting a smooth texture. Store in a jar, keep in the fridge for a week or up to three months in the freezer. The idea of creating a lemongrass tartar sauce came to me randomly. 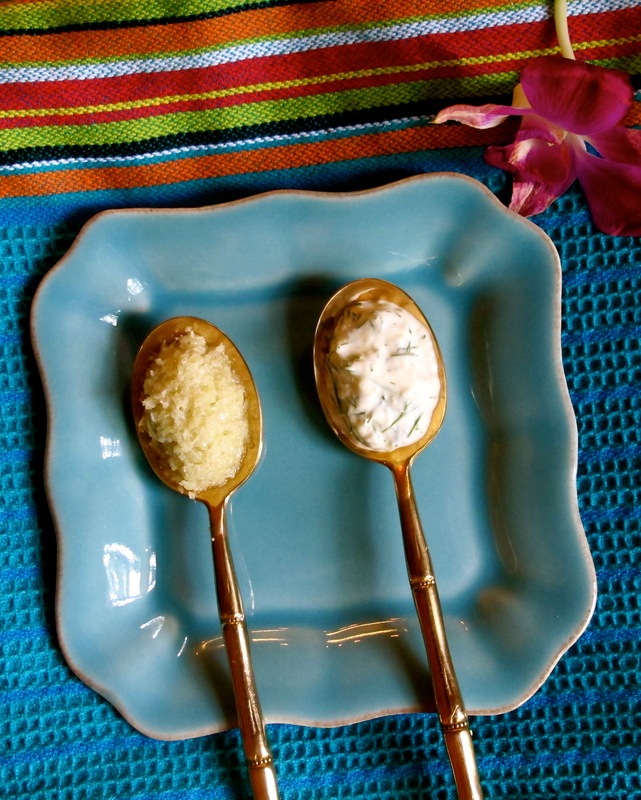 My son loves fish with tartar sauce and I have made tartar sauce for him many times. 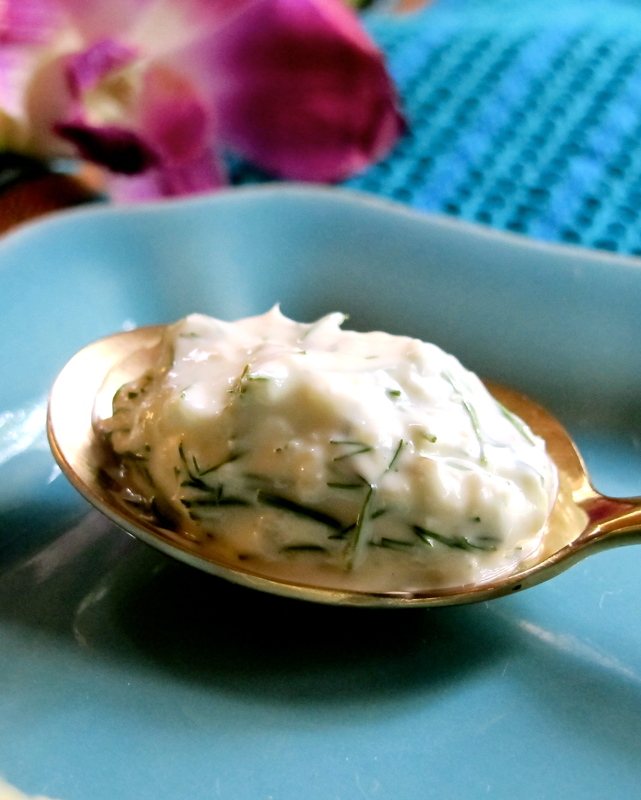 Many western chefs, such as Christine Keff from the Flying Fish in Seattle, have created an awesome lemongrass aoli, so I thought why not a tartar sauce? I use serrano peppers and dill as they go really well with fish and keep the color palate to just green. I love the results and would use this sauce in many ways, not just for fried fish. In a one-cup bowl, stir together mayonnaise, lemongrass paste, serrano pepper, pickled cucumber and lemon juice until well-mixed. Stir in dill until it is well-combined. For the best results, prepare the night before or at least 30 minutes before serving. Last Saturday I went to the Pike Place Market to get the fresh fish of the day for my family dinner. Golden trout caught my eye. When I visited the market last summer, only City Fish carried it. This time around it seemed that every fish stall had a pile of golden trout, so I thought this would be a perfect time to share my recipe with you for Steamed Golden Trout in Lime-Chili-Garlic-Dill Sauce. The pictures were taken a while ago, but the recipe is timeless. It is based on Phuket Pla Nueng Manao—steamed fish in lime juice—but the way I prepared it reflects my new home in the Pacific Northwest. Golden trout is a sub-species of rainbow trout, both of which are related to salmon. The pale pink color of the flesh and its texture are a really amazing mixture of both trout and salmon. There are many ways to prepare golden trout, but today my favorite is to steam them. I love cooking fish whole, so using the oven is a quick way to go. The golden trout I bought was from a farm in Idaho. Golden trout’s natural habitat is the “clear, cold headwaters of creeks and lakes at elevations above 6,890 feet,” but most golden trout come from fish farms. This is because you may fish for them for your personal consumption but not to sell them commercially. Most golden trout in the markets are from the Idaho Trout Company. From my research I learned that fly fishing for rainbow trout and golden trout is a very popular activity. When it comes to steaming fish, I am my grandma’s grandaughter. I ate many meals of steamed fish with my grandmother, like Clay Pot Lemongrass-Steamed Fish (Pla Nueng Morh Din). I hope you will have a chance to cook a few of her recipes. Several of them are featured in the Asian Grandmothers Cookbook by Pat Tanumihardja. At home here in Seattle, I have adapted my grandmother’s recipe into an easy and fun way to prepare fish for my friends and family. My recipe below reflects my quick and easy method for doing this at home. I will let you decide which way you prefer. If you love fish, this recipe works for all occasions! It is light, fresh and delightful — yet easy to prepare. While steaming the fish, prepare the sauce. When the fish is cooked, just pour the sauce over it and serve with hot, fragrant jasmine rice. Using a mortar and pestle, pound garlic, peppers, cilantro root and salt until smooth. With pestle, blend in sugar, fish sauce and lime juice until sugar dissolves. Stir in dill. Set aside. Preheat oven to 375°F. Place 1/4 cup water in a 9” x 13” baking pan, then spread the lemongrass out. Place the trout on the bed of lemongrass and sprinkle salt on top of the fish. Cover the dish with parchment paper and then the foil, wrapping it around the edges to form a seal. Bake until the fish is cooked, about 10 to 15 minutes. (The good thing about steaming is you never overcook the fish). To check if the fish is done, insert a knife into the thickest part of the fish and lift the flesh away from the backbone. If it is easy to separate the flesh from the backbone, then it is done. If not, steam a little bit longer. Place trout on a serving dish along with all of the steaming water. Pour the lime sauce over the top, then garnish with sliced limes and serve with jasmine rice. ~Thai chilies are recommended for this recipe because they have a lingering flavor; you may remove seeds if needed. To control the spiciness of your finished dish, use 2 chilies for mild, 3 or 4 for medium, and 5 or 6 for a full spicy flavor. ~Always add the fish sauce before the lime juice to keep the sauce vibrant and fresh tasting. ~Best of all is to prepare the sauce while the fish is cooking. If you have a steamer, you can steam the fish in a serving size bowl and pour the sauce on top just before serving. ~The sauce can be used as a dipping sauce for any seafood, including mussels, clams and crab meat.